The colors in Green Lantern are so spectacular that they actually seem to pop off of the screen, even shown in 2-D. The story, however, is about as flat as they come. The characters are only mildly interesting and the narrative feels as though it is dragging from one special effects sequence to the next. It is a drab and dull film which doesn’t seem to have enough of anything. It could use more humor, more action and more relevance. Instead it seems destined to be the dud of the films leading up the Avengers film. Like many superheroes, Hal Jordan (Ryan Reynolds) does not ask for the abilities given to him. He works as a test pilot, pushing the boundaries of what is possible while infuriating his employers with daredevil tactics. 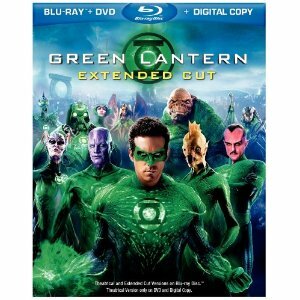 Having watched his father die in a test flight, Hal seems determined to end up the same way until he is chosen by a mysterious alien force to be a member of the Green Lantern. No human has been chosen for this intergalactic force which protects the peace, but Hal may be Earth’s only chance when an engulfing force known as Parallax threatens to end all of humanity. Although the film itself might be light on entertainment, the Blu-ray is packed full of surprises. Although the combo pack also comes with a DVD and a Digital Copy, only the Blu-ray disc has both the theatrical and the extended version of the film, which is nine minutes longer. The Blu-ray also has the exclusive viewing mode which has feature-length playback exploration of the film’s production, which picture-in-picture commentary, character bios, galleries, storyboards and the content of eight featurettes. There are additional special features as well, including deleted scenes and a digital comic.